Naas works in our garden and I have tried to capture some of the character he has in his face as well as his kindness. I have used willow charcoal together with charcoal pencils (light and dark) and graphite pencil. 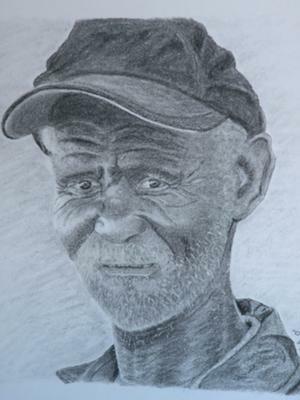 I have seen very few examples of charcoal drawings in and around where I live in the Western Cape, South Africa. Thank you for this opportunity. Also thank you for a wonderful web page, Douglas. Doug's Comments: A beautifully expressive drawing. You have nice control of your charcoal.